Click Here to ﻿﻿download the registration form. Registration fees of applicants who were not able to be placed will be refunded. Registration fees of applicants paid but choosing not to enroll will not be refunded. Openings are filled on a first come, first serve basis - come be a part of this ministry of First United Methodist Church of Rutherfordton! You may e-mail or call Kathy Watson at the church office at 828.287.3704 for more information. 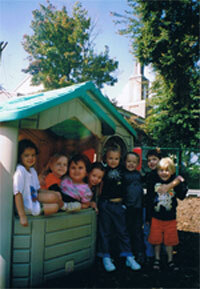 The Tot Learning Center is a pre-school program for ages 15 months - four years old. The classes are sponsored by the First United Methodist Church. The Tiny Tots class is open for children turning 15 months by August 31st. This class is from 9:00 - 11:45am on Mondays, Wednesdays and Fridays. There is an optional 3- or 5-day program for our Two, Three and Four-year-old children, operating from 9:00am - 12:00pm. Children should turn two by August 31st for the Two-year-old class, three by August 31st for the Three-year-old class and four by August 31st for the Four-year-old class. The students already enrolled in our TLC program automatically receive priority for a position in a class for next year. All church members are guaranteed a position within the school for the next year. After that, students are taken on a first-come first-serve basis. Class size is limited so we can guarantee individual attention within our program. The purpose of the program at TLC is to provide an environment for the child to grow physically, socially and spiritually. Cognitive-Reading: A number of math and reading readiness activities are used, including LetterLand; a preschool phonics program. All activities are offered to the child without pressure on an individualized basis. We welcome you and your child to our program and look forward to our time together. of its educational policies, admission policies, scholarships, and other school administered programs.